Does Gaining Range of Motion Really have to Hurt? Not all physical therapists are created equal. Nor does gaining range of motion have to be extremely painful! Unfortunately there is this idea among the public that physical therapy has to hurt to be effective. In most cases, nothing could be further from the truth. Sadly enough there are plenty of physical therapists out there who also believe "no pain, no gain" to be true. Before we go any further, I need to clarify that pain is very different then a "stretch", "pull", "pressure" or "fatigue/workout soreness". Just because I don't believe in "no pain, no gain" doesn't mean I'll vouch for laziness or sub-par effort. – When the brain starts feeling ‘stress’ it goes into protection mode. A pain response results in signals sent to muscles, fascia, and joint capsule to literally tighten down to protect the painful structure. So the entire time your PT is cranking on your new rotator cuff repair, knee replacement, or you are cranking on it at home per their instructions. Your brain is busy fighting back. The result is lots of pain and minimal progress. – Pain fires up your sympathetic nervous system, the part of the system that handles ‘fight or flight’ situations. 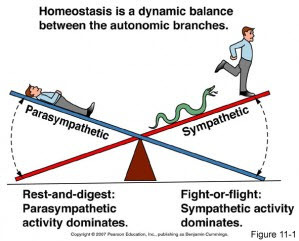 To complicate matters, research has found that a lot of people are already in this sympathetic state even at rest. These individuals tend to exhibit increased stress hormone levels that result in poor sleep patterns and poor recovery from workouts and games (If you are coming off of surgery, I would argue that you are already in this state to some capacity anyway). This elevated level of stress over the long term can have some serious effects and implications on rehabilitation. The moral of the story here is that increased pain levels correlate with increased stress levels which can delay healing and recovery. Some pain is going to be present when you’re dealing with an injury or surgery, but your therapy should not be making you consistently feel worse! Increased pain is not an ideal situation for someone trying to gain range of motion, strength, and returning to work or athletics. 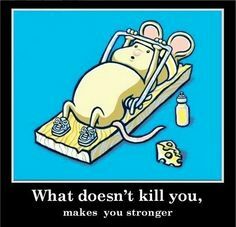 So how do we avoid the "no pain, no gain" philosophy! For starters, you still need to put forth maximal effort. Laziness will not get you out of pain. If you are post surgery then you should expect some type of "stretching" or "pulling". It is very important to distinguish between this and actual pain. The surgical limb has to move (when appropriate) and move frequently in order to start improving and building back up normal tissue resiliency. However, you want to avoid jamming your limb through further ranges of motion putting yourself into a further stressful (sympathetic) state then you already are post surgery. Taking this a step further, in both surgical and non surgical folk we want to consider other areas which could be contributing to your overall dysfunction and pain on movement. This means looking at the joints above and below the injured area to make sure they are functioning optimally. Assessing the difference between active and passive movements also plays a role on distinguishing between actual soft tissue restriction or just lack of motor control or coordination in those end ranges of motion. Muscle strength, endurance, work capacity, and timing are all important factors as well. Next time you go through a physical therapy treatment, or any treatment for that matter, ask yourself if all these things are being assessed? If your program feels like a cookie cutter program then it probably is! Find a provider that understands pain and will take the time to assess/reassess movement. In most cases, there are better ways to gain range of motion and strength than trying to push through restrictions and pain.